few areas that looked really good. When I got there I saw that only one of those areas was open to the public. This is where I decided to lay a boardline. I took about 30 pieces of ¾" plywood cut in 2' X 4' sections. I then walked them in and laid them out in 3 strait rows so I could find them easily if they became lost in the high vegetation once spring arrived. them and I'm pretty sure no one had found them in those 4 years. Here is the first Cal king I found that day on February 21st. I went on to find one more Cal king and 3 small SD Gopher snakes. I was very pleased with how well I did there. Here is one of the kings I found on a return visit. This one is normal for this area. 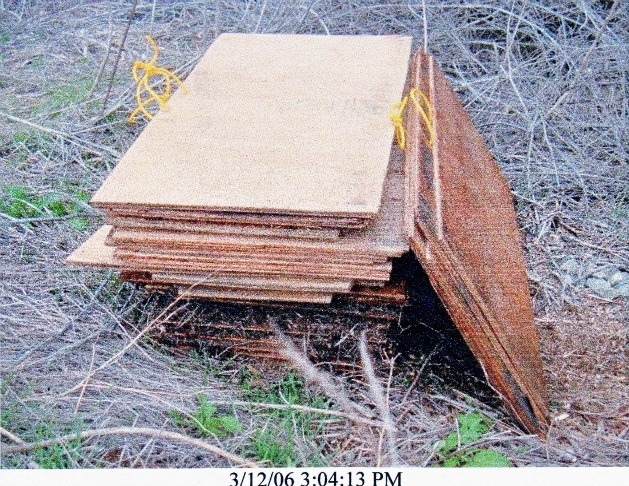 Thin yellow bands on a brown ground color. that's exactly what I found under this board. It was an amazing feeling lifting that board and finding this Newport laying there. All that hard work payed off with this snake. boas do this as well when first caught. It sure made for a cool picture. time I wanted to spend on this guy. it of course. lol This will always be a day to remember. in its light bands and a lighter shade of brown in its dark bands as it matures.